Create Charts in Excel - Getting Stared With Excel Charts! Well! we have seen some basics of charts in the previous topic. Now, we will see how to create charts in Excel. In this session I will take your through the step by step to create basic charts in Excel. Then we will see the advanced charts options to customize charts in Excel. Getting Started with Charts in Excel and Create Charts in Excel. Start Learning And Create Awesome Charts in Excel. We will understand what are the basic things required for creating Charts in Excel. 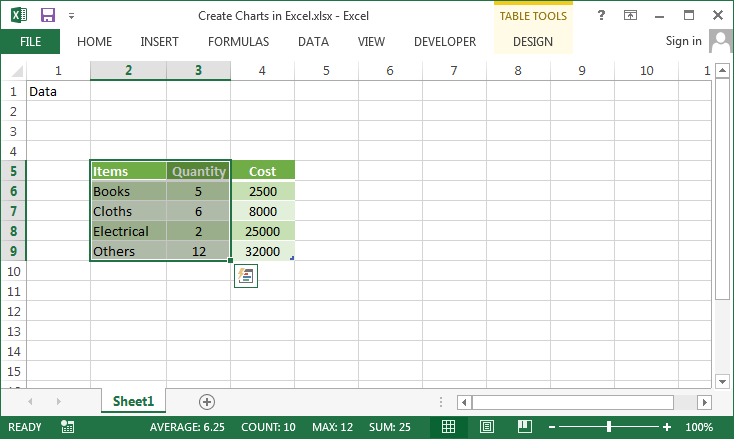 and then we will see the Step by Step approach for Creating Charts in Excel. Let us see what are the basic things we need for creating a basic chart: We have to consider the following things before creating Charts in Excel. Data: We need some data to plot the Charts in Excel. Now we will see what are the basic steps we need to follow for creating Charts in Excel: Steps for creating charts are more or less same in all version of the Excel (Excel 2003,2007,2010 and 2013). We need to follow the following steps to create Charts in Excel. As mentioned in the above we need some data to plot the Charts. Here is the sample data which we I am going to use for explaining this topic. There are three fields: Items, Quantity and Cost. In this example, I want to show you the graph for Quantity of Items. So, we need to select Items and Quantity for Charting. You can the following screen-shot how I have selected the required data for charting. Now we have to select the Chart Type. As this data is categorical, we can select Column Chart Type from the Charts Ribbon Menu Tab. You can see following screen-shot how how I have selected the Chart Type from the Ribbon in Excel. Now our chart is ready, we can re-size and position wherever you want in the Worksheet. 2. Mouse hover on Chart Border/Edge, your mouse icon will turn to a two side arrow icon (re-size Icon). Then hold the mouse re-size the chart as per your requirement. 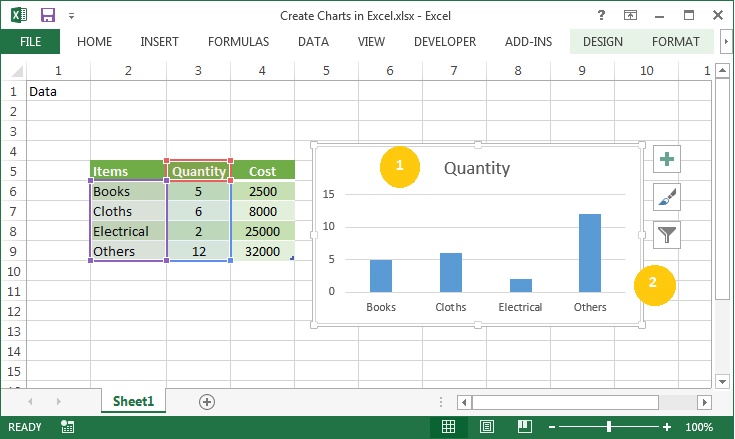 We have already see how to create basic charts in Excel. Now we will see the creating frequently used charts in Excel. As discussed above, Column chart is suites to present the categorical data. We can quickly have look at the graph and understand the data. It is also good for comparing two groups and determine the groups. 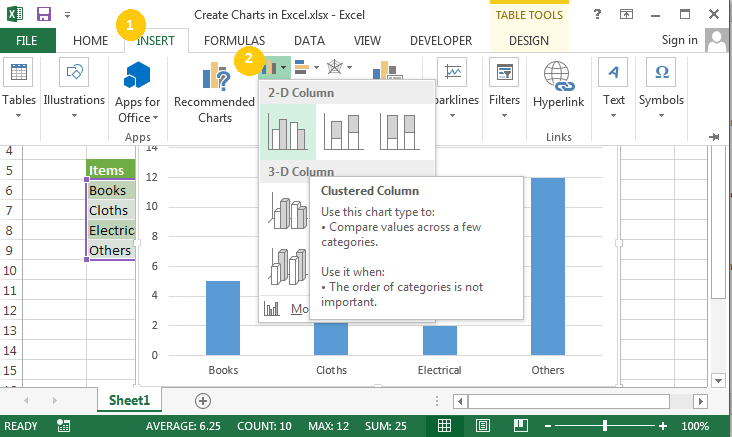 Here is the example chart to show you how to compare two groups of data in Excel Charts. By looking at the graph, we can quickly understand that the purchasing cost is more in 2013 in all the categories than 2012. Bar chart is useful to study different categories and their ranks. You can use for representing the ranking data or customer satisfactions score for the different products or any item. 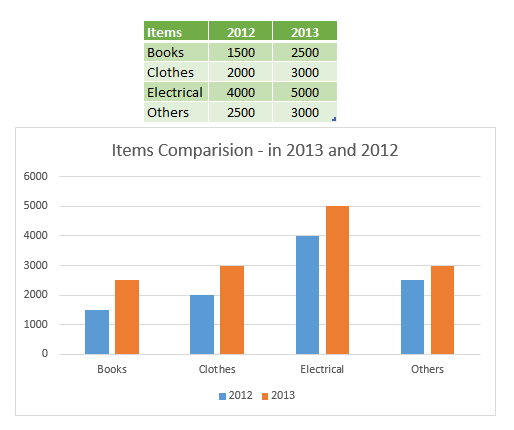 Following is the example data and Bar Chart to show how we can use Bar Charts in Excel. Generally we sort the data before plotting on bar chart if the we study categorical data. If it is rating scale we should not sort the data. In the above examples, we can see the rating scale is remained same and the other charts with categories is sorted based on the reposes. By looking at these graphs we can quickly undertand the data and derive meaningful insights. Pie charts is the another useful charts in Excel, we generally use how the different categories are distributed in population. We can easily conclude the data by looking at the Pie charts how different groups or categories are sharing total value. 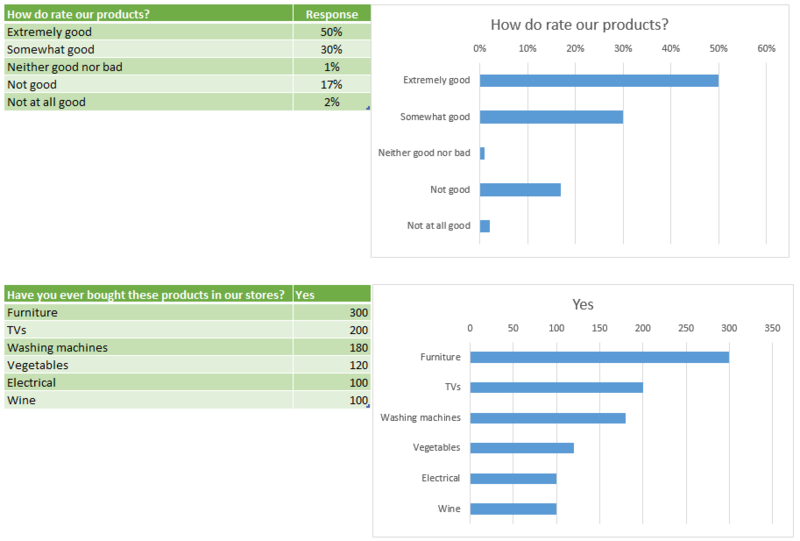 Based on the above charts we can understand most of the customers are liking the products.